Hey everybody once again we’re here at IRCHA with another Road Noise segment. We’re over here at the fpv racecourse with me I have Bobby Watts and Bert Kammerer. 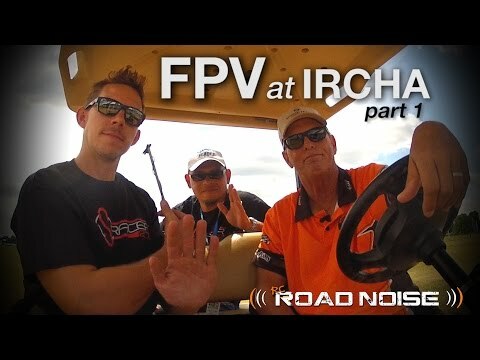 These are the two forefront guys in the industry that are pushing the FPV racing side want to get some insight on what’s going on. They held a really nice race here at the IRCHA. Just finished up, but how do you have had one of your guys opinion about it came out? (Bert) It’s interesting because there’s a lot of talk about FPV “oh you know those guys are taking the heli guys down, taking away the helicopter hobby” and I think it’s a think it’s a completely different discipline and I think it doesn’t really take away from helis I think it adds to the hobby. So this was an interesting weekend we had a lot of helicopter guys come out here do the race and then go back. Had the the number one finisher you know the winner of our A classes, we call it was Ducan Bozione from France. (Frank) Very good. (Bert) We had some guys from Horizon that have been heli guys in the past you know. And still to some degree. We had Jason Bell from A Main Hobbies, you know that’s a heli guy also come and raced and then he went back over there. So it was interesting we had a lot of traffic back and forth. (Frank) What do you what do you think the ratio of non-heli guys to heli guys here seem like? (Bobby) Here it seemed like most people who had FPV machines had a heli of some sort. So this was very much because it was held during the Jamboree So it was a separate event it probably would have been more dedicated FPV guys but we’re just trying to help people cross that bridge into the FPV world. (Frank) What was the response from all the guys were they happy with it did something that they want to see do again? (Bobby) Yeah yeah I think they had a blast. We tried to set it up more like a fun fly. So this we wanted Matt we call it smack fast. We wanted smack fast to feel a lot more like a fun fly with your buddies and we had a bunch of open flight stations if you just want to get together with your buddies put your quads down talk a bunch of smack and go fly you could do it. Then we had organized races for about two hours every day. But overall it was it was really good. (Bert) All the challenges that we have to deal with when it comes to FPV you know, video issues and all these things you know FPV is still in its infancy right?. And this weekend was flawless. I guess you could say we have very few issues we had a couple guys over there that were powering things on we took care of it quickly so it was fun i think everybody enjoyed themselves. (Frank) Now as as to premiere heli pilots coming over to race do you find this more enjoyable? Or do you still find your love with the helis. (Bobby) It’s different it’s totally different. So it’d be like you could take your pattern airplane out and have a blast and then you can take a 3D airplane out and still have fun, but it’s two totally different things so we still totally enjoy heli and we fly them pretty often actually. And then if we do FPV we just usually go to his place and and just tear it up around his yard. So it’s two completely different disciplines as Bert said, but it’s just different. The coolest thing we find is that if you have a real tight race and you round a corner and someone over takes you it’s on! And that’s the one of the coolest feelings in the racing With helis you don’t get that is so much. You know? (Bert) You get to do it with other people at the same time you know and you’re flying heli you’re front and center. You’re “the show” the show man or whatever and they look at your back and they look at the heli and you’re in the middle. You know you’re the one doing the whole thing. Here you just get to do it at the same time with everybody else and it’s just such a cool thing to share that at the same time with other people. The issue of that FPV is that it’s not a spectator sport. You know when you watch quads that you especially here we did a very large course you know these things like what 200 yards deep so these little quads disappear in the distance. (Frank) Right. (Bert) The beauty of it is that this year for the first time I think at least here at the IRCHA Jamboree we had AMA being kind enough to let us borrow their trailer setup which has five different monitors. So we had live stream from the actual feed that the pilots were watching while they were flying we had that being broadcasted to the trailer. So spectators can see the the actual quads flying through the course and they could turn around and look at what the pilots were seeing as they’re flying through these gates and flags and so forth. That’s pretty cool you know? (Frank) Now what do you think it would take to turn it into a more of a mainstream spectator sport? (Bobby) That’s a good question, that’s what we’re trying to figure out. To be honest. We want to do another event we definitely want to keep smack fest going as Bert said. We think the number one thing is spectators. We need to cater towards the spectators, but always keep the pilots in mind. So if you think of any soccer big soccer stadium football stadium there’s Jumbotrons for a reason right because not everyone can see the court or the corner of the field. So that would certainly help. Maybe a little bit less downtime in between so it really makes sure, maybe make sure your guys are ready with their frequencies. (Frank) With that comes in more staff to get everybody rounded up and everything. (Bobby) Lots of volunteers we need more help. I mean we had some great help here, but we only had I think at most like 25 racers going at the same time. But overall I’d say we learned a lot and and I think it’s gonna happen i think you’re going to see this. I don’t know about a stadium event, but I can certainly see FPV races being as big as Top Gun or being as big as the IRCHA Jamboree. I can see it happening. (Bert) It’s so exciting. I mean there were a couple of races throughout the week here right that I think yesterday or the day before I think it was you and Miguel, there were a couple of races were you know these guys were passing each other and then this guy would take you know first place and second place would overtake first place and they were just fighting for first place. And there were 2 or 3 times when they passed each other and they were fighting through the turns. That’s awesome when you see it from the pilot perspective because you can see that the other quad is over passing you from top or below or whatever, that’s really exciting. Even more so than looking at it live..